CLEP testing is a great way to earn college credit for what you already know. You can also use CLEP testing to earn college credit without actually taking a paid course. You can study independently and then take the CLEP test to earn the credit you need. Here are few of the most commonly asked questions about CLEP tests. 1. What is a CLEP test? A CLEP test or College Live Examination Program is a credit by exam program thaat has been in existence for over 40 years. 2. Are CLEP tests difficult? CLEP tests require academic instruction or significant independetn study of the subject matter. 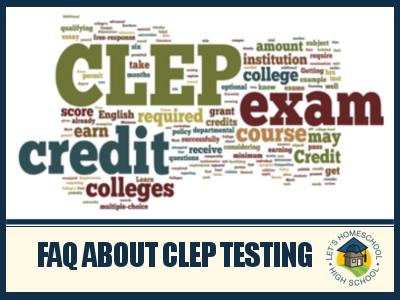 The CLEP test covers an entire college class or more. Each CLEP test will assess the student’s varying levels of content related knowledge and award credit based on that mastery level. For example, you can acquire up to 12 credit hours for the Spanish CLEP test depending on your level of mastery. 3. How are CLEP tests administered? CLEP tests are administered at over 1,800 various testing centers throughout our country and overseas. 4. Where can you take a CLEP test? Most testing centers are located on college campuses, yet some centers are available on military bases. 5. Do CLEP credits count as college credit? Yes, CLEP credits count as college credit. Over 2,800 U.S. and international colleges and universities will accept CLEP credit. 6. Do all colleges accept CLEP credits? Before taking a CLEP test check with the colleges or universities you are interested in admission to. Some of the more elite schools will not accept CLEP credits directly. One college in Georgia, for example, doesn’t accept CLEP credits directly, but will allow them to be transferred to a sister college and then transferred in to their college. 7. How do CLEP credits transfer? CLEP credits are essentially “banked” by the College Board until you need to transfer them to your college. 8. What CLEP tests are available? There are 33 CLEP exams available in core subject areas as well as some specific subject areas. For a complete listing of CLEP exams visit the College Board CLEP Test listing. 9. So you need to take an actual course to prepare? Some students may not need to take a course to prepare, while others might need instruction. For example, if you were taught Spanish as a child, you may be able to several hours of credit through the test without taking a course. 10. What study resources are available? There are a variety of free CLEP prep courses and even CLEP practice tests through various online resources. If you prefer to study with paper and pencil, you might want to look into the College Boards CLEP Test Prep Book. 11. How do I register for the CLEP test? You can visit the College Board website to register.